End your WooCommerce Pricing worries with ELEX Dynamic Pricing and Discounts Plugin for WooCommerce, that helps you to easily apply WooCommerce dynamic pricing and discounts at the product, combination, category and cart levels. The plugin offers dynamic pricing without complex calculations and configuration on the admin panel. You can easily apply complex rules based on the percentage or flat discounts, or even dynamically set a new price without too much effort. One outstanding feature that sets apart this plugin from its competitors is the special control it gives to store owners to set a maximum discount limit over every rule. The plugin offers a ton of exciting features for WooCommerce Discounts. WooCommerce Variable Pricing discounts, and displays discounts in a pricing table and offer table in the product page. The Pricing table would display all the Product rules associated with a particular product. This would help the buyer to know of all the available discounts. 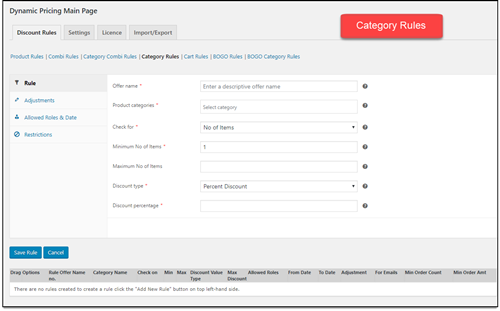 The Offer table would display all the available rules associated with a particular product. This too would help the buyer to know of all the available discounts. Offer Percentage, Flat Rate, or Fixed Price discounts on Quantity, Weight, or Price of the products. You can set a Maximum discount amount to limit the discount amount and also set Price adjustments. You can also use other parameters like User roles, Validity period, Discounts restricted to emails, and number of order, etc. Offer discounts on a combination of two or more products. When the selected products are bought together with the required quantity, the discounts will be applied. Similarly, you can offer discounts on Combination of Product Categories. Similar to Products, you can offer discounts on Product Categories as well. Buy more than 10 pounds from grocery category, and get 30% discount 12% discount on mobile category for our wholesalers (specific role) valid from dd/mm/yyyy to dd/mm/yyyy. Cart-based discount can be set up either per product basis or can be applied as a whole to all the products in the cart. Similar to this, you can offer BOGO offers on Product Categories as well. DISCOUNT PER PRODUCT OR PER VARIATION: Each product or each variation can have a separate discount based on either quantity, weight or price. DISCOUNT PER CATEGORY: Category based discount can be set up either per product basis or can be applied as a whole to all the products of the category. DISCOUNT BASED ON QUANTITY, WEIGHT AND PRICE: Any type of discount rules can set up based on either quantity, weight or price. DISCOUNT TYPES CAN BE PERCENTAGE, FLAT AND FIXED PRICE: There are three possible discount types for every discount rule. Fixed price would replace the original price of the product. DISCOUNT BASED ON THE CART PARAMETERS: Cart based discount can be set up either per product basis or can be applied as a whole to all the products in the cart. BUY ONE AND GET ONE RULES: ‘BOGO’ rules are easier to set up. Buy any quantity of a product and get any quantity of a different or the same product. DISCOUNT BASED ON PRODUCT COMBINATIONS: Combine two or more products and apply the discount on both or either of them. This feature can be made use to boost the sale of a non-selling product by combining it with a popular product. DISCOUNT BASED ON USER ROLES: Some discount rules can be restricted to certain customers based on their roles. For example, you can set up separate user roles for your frequent customers and can choose to give separate offers to them. AUTOMATICALLY ADD FREE PRODUCT TO THE CART (Adv. 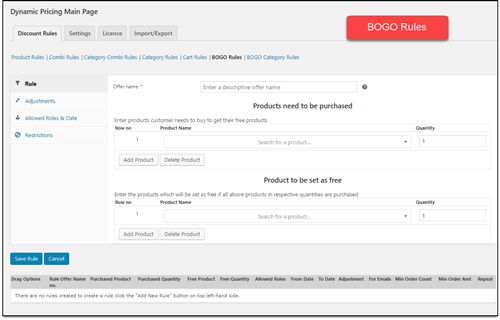 Feature): When you set up a “BOGO” rule, it’s desirable that the free product gets automatically added to the cart. You can use this feature to give out samples of your promotional products. EXCLUDE A PRODUCT FROM A CATEGORY OR CART RULE (Adv. 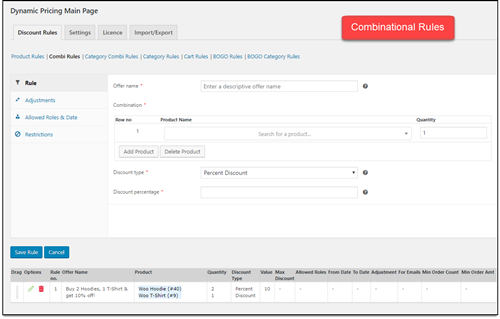 Feature): You can choose to exclude one or two products from following the discount rule defined for its category or the entire cart. This can be achieved by one of our add-ons. SET A MAXIMUM DISCOUNT: You can set up a maximum value in order to limit the amount of discount. IMPORT/EXPORT FEATURE: The Pricing table would display all the product rules associated with a particular product. This would help the buyer to know of all the available discounts. PRICING TABLE IN PRODUCT PAGE: The Pricing table would display all the product rules associated with a particular product. This would help the buyer to know of all the available discounts. 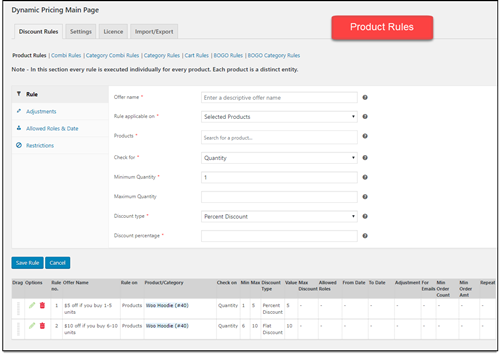 OFFER TABLE IN PRODUCT PAGE: The Offer table would display all the available rules associated with a particular product. This too would help the buyer to know of all the available discounts. CART DISCOUNT BASED ON PRODUCT ATTRIBUTES (Adv. Feature): Offer discounts when selected product attributes and attribute values are added to the cart. You can either choose to match only one attribute or match all the selected attributes. CART DISCOUNT BASED ON SHIPPING METHOD (Adv. Feature): You can select desired shipping methods for which you want to offer cart discount. This type of discount can be applied to both default WooCommerce shipping methods as well as third-party shipping services like DHL, USPS, and so on. CART DISCOUNT BASED ON PAYMENT METHOD (Adv. Feature): Offer cart discounts to the desired payment method(s) that you offer on your WooCommerce store. DISCOUNT BASED ON THE NUMBER OF PREVIOUS ORDERS (Adv. Feature): You can use this rule to provide special discounts to your returning customers who had remained loyal to your store. DISCOUNT BASED ON THE AMOUNT OF PREVIOUS ORDERS (Adv. Feature): You can use this rule to provide special discounts to your returning customers who had remained loyal to your store. Sometimes it’s more important to consider the amount they have spent on your purchases from your store. DISCOUNT BASED ON THE EMAIL ID (Adv. Feature): You can restrict the rules based on the email id of the customers. This would be useful to give discounts to specific customers. CHOOSE THE RULES WHICH ARE REQUIRED TO BE APPLIED (Adv. Feature): A number of the available rules might satisfy the cart scenario. In that case, you can choose to either apply the “Best Discount” or “All Match” or “First Match”. ENABLE/DISABLE OR CHANGE THE ORDER OF THE RULES (Adv. Feature): The drag and drop feature under every rule category enables you to change the order of execution of the rule. Similarly, you can choose to change the order of execution of “Product rule”, “Category rule” etc. CUSTOMIZE THE PRICING FORMAT FOR VARIABLE PRODUCTS (Adv. Feature): By default, the price range is shown under the product title. You can customize it to “Starting from” etc. This can be achieved by one of our add-ons. REPEAT RULES IN A GROUP (Adv. Feature): You can choose a particular rule to be repeated for every multiple of a number. For example, you want to give the discount for every 3 items a customer purchases. 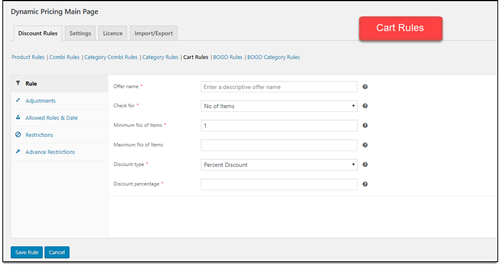 Cart rule discount based on Attribute. Cart rule discount based on the Shipping Method. Cart rule discount based on the Payment Method. Buy minimum three units of a product (P1) and get 15% discount (maximum discount allowed = $12) . Display Discounted Price on Product Page and Shop Page. Show discounts across each line items in the cart. WPML Compatible, along with Out-of-the-box Support for French and German (Deutschland) Languages. After weeks of searching and trying various plugins, this is in a league of it’s own. Other plugins boast about there BOGO on their Pro plans but they cannot accomplish what this plugin does. At 1st I thought oh no it does not work as I was hoping it would, so I emailed support and received a quick response. Thank you Lorenzo for your advice in fixing the issue, which was my mistake in not setting rules correctly. If I could give you more than 5 stars I would! Anyone needing a pricing and discount plugin, look no further as this is a brilliant plugin! Great plugin and realy good support! What version of WooCommerce is compatible with the Dynamic Pricing plugin? The plugin requires WooCommerce 3.0 or the later versions. It works with version 2.6.14 as well. However, it can cause a few issues as a few functions are no longer in use from the older version of WooCommerce. Our developers will help you fix those, but we would recommend using WooCommerce version 3.0 or above. What are the Themes supported by the plugin? Currently, we support themes such as Flatsome, Divi, Storefront, Twenty Sixteen, and a lot more. Generally, if a theme follows WooCommerce standards, the plugin will support it. For exceptions, our developers will help you with theme compatibility, provided you give us some time. Here’s a list of compatible themes with ELEX Dynamic Pricing and Discounts for WooCommerce plugin. Is there any limit to the number of rules we can add? There’s no limit to the number of rules you can configure in the plugin. However, if you have a huge number of rules to execute, it might slow down the page load time by a few seconds. This is because the plugin calculates the discounts dynamically. Can we offer a discount on shipping as well, using this plugin? Unfortunately, this plugin works only for product prices. It does not apply to shipping and other fees. Can I use this plugin with other discount plugin or coupon codes? When used along with coupon codes or another plugin, it may cause conflict. It might apply multiple discounts or only one of the discounts will work. The way it works with other coupon codes or discount plugins is not predictable; we recommend to use our plugin alone. Can I offer a free item on purchase of some products? Or how does the BOGO rule works? To offer a free product you need to set up a BOGO rule. Set a specific product or combination of products to be purchased with a minimum quantity, and specify which product is offered as free. Please note you cannot offer a random product as a free product. You need to specify a free product. Can I use this plugin to offer a discount only to few user roles? Yes, you can use our “Allowed Roles & Date” feature in the rules tab, where you can specify the user roles for discounts. Can I restrict the discount to certain dates or period? Yes, you can use our “Allowed Roles & Date” feature in the rules tab, where you can specify a start and end date for how the rules will be applied. Can I use the same license key in both Staging and Live site? If you have purchased the single site license, you can keep the license activated only one site at a time. So if it is activated on the staging site, you cannot activate it on the live site, but the plugin will work on both sites. However, if you want to activate the license on the live site, you can simply deactivate the license on the staging site and use the same license key in the live site. Can I assign a price to the products for a specific user role? Yes, you can add a fixed price for a product for a user role using product rules, but it’s best if you use our other plugin, ELEX WooCommerce Catalog Mode, Wholesale & Role Based Pricing, which is designed for that specific purpose. Excellent plugin with fast support. Doing what it’s supposed to, and nothing more. Ugly interface but with a super good functionality. They were very helpful and answered all of our questions in a timely manner. Helped to get the plug in to do exactly what we needed it to do. Comprehensive, well-designed plugin. Excellent customer service. We all know sometimes getting in contact with developers is a headache but THESE GUYS ROCK!! A response within hours every time and they go above and beyond to make sure you are enjoying the product. Great experience. After weeks of searching and trying various plugins this is in a league of it’s own. Other plugins boast about there BOGO on their Pro plans but they cannot accomplish what this plugin does. At 1st I thought oh no it does not work as I was hoping it would, so I emailed support and received a quick response. Thank you Lorenzo for your advice in fixing the issue, which was my mistake in not setting rules correctly. If I could give you more than 5 stars I would! Anyone needing a pricing and discount plugin, look no further as this is a brilliant plugin! I had a unique situation with the plugin. I wrote to support and within 12 hours I had a solution. This is the first time I have worked with the support staff and it was a pleasant experience. I own other plugins from here and will buy others in the future. La règle “BOGO” que je voulais mettre ne place ne fonctionnait pas. Le service assistance est intervenu et a réglé le problème. Great plugin and support! They did even the effort to develop a new Category feature. thanks! Good and pretty flexible plugin! 5 stars for super and fast support! Outstanding support from day one. Asked many a question over and over and continually got support in a timely manner. To me a plugins worth is how long it takes to get replies on things and Xadapter is on top of things when it comes to support even if it is out of the ordinary. Great company and super plugins. Very easy to use plugin. The support team is quick to respond, and were able to update the plugin to account for the scenario I was needing. Great product for setting up custom tier pricing, and even better customer service. There is a fatal error on line 400 in the file /public/valid-rules-class/product-rules.php file. Great Plugin Tutorials were very helpful in this setup. Creating coupons aren’t necessary since I set up most deals with an incentive for multiple purchases.